From the very first women’s cricket Test match in Brisbane in 1934 to the most recent in Sydney in 2017, and every Test match in between, these are the nineteen women who have had the honour to captain Australia’s Test cricket team. The challenges, both on and off the field. The tactics, the personalities. The controversial selections. The drama. The triumphs and the heartaches. From the backyards of Lismore, Glenelg, Shepparton... to the big time at Lords, the Gabba, Mumbai, Sabina Park. Travel back in time to the pioneering captains… Margaret Peden, Mollie Dive, Una Paisley; through the ages to Muriel Picton, Miriam Knee, Anne Gordon, to modern day greats, Alex Blackwell and Meg Lanning. There's household names Belinda Clark, Karen Rolton, Lyn Larsen, Jodie Fields. 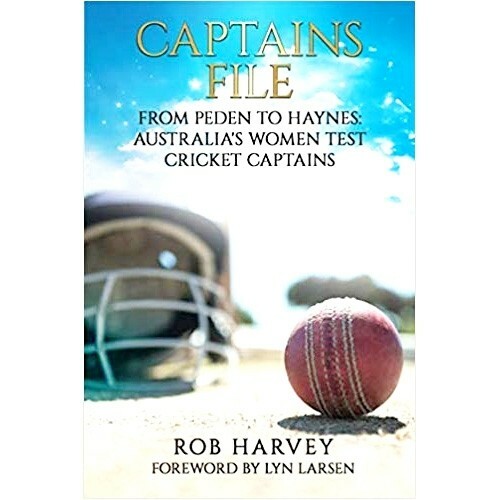 Rob Harvey’s Captains File: From Peden to Haynes, Australia's Women Test Cricket Captains takes you on a journey to the first battle for the Ashes at home and the voyages across the seas to England to take them back; tours to India, the Caribbean, New Zealand, from the visionary Margaret Peden to the new age under Meg Lanning and Rachael Haynes. “Australia’s women’s Test cricketers have an enthralling past, their history beautifully brought to life by Rob Harvey. Rob has produced a unique, unprecedented piece of work which draws you in and brings so much to you as the reader.” – Lyn Larsen For the first time, every one of Australia's women Test captains all together in a fascinating account of women's Test cricket in Australia.